BACKTOFRANKBLACK.COM: Coming soon! Lance Henriksen Blogathon Week! Back To Frank Black is very proud and perhaps, a little bit humbled to be co-announcing the latest, most exciting event for Lance Henriksen fans so far this year! 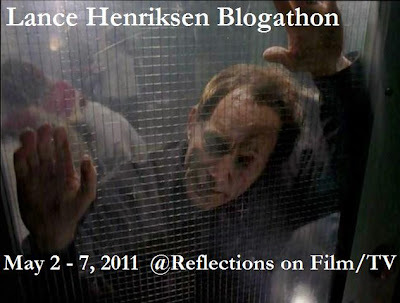 Alongside writer, reviewer and big Millennium fan John Kenneth Muir's Reflections on Film and TV, we are announcing the Lance Henriksen Blogathon Week! A week of Lance Henriksen blogging masterminded by John himself and Nightmares in Red, White and Blue writer/producer, Joe Maddrey! So what's this about? Well I think John will - as always - put it more succinctly thank I. He's sent us his promotion for this upcoming Blogathon week for you all to read. It's a great idea - and we'd be honoured if you'd join us in supporting John and Joe in a week dedicated to Lance Henriksen! If you're a blogger and a Lance fan, this will be of GREAT interest to you! 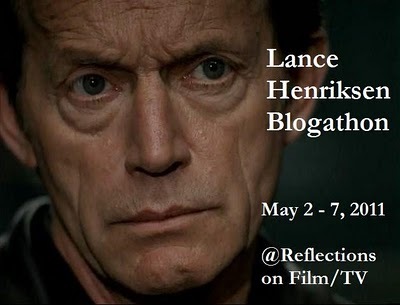 "I'm very proud and honored to announce that this blog, Reflections on Film and TV, will soon host a blogathon dedicated to the great actor, Lance Henriksen. 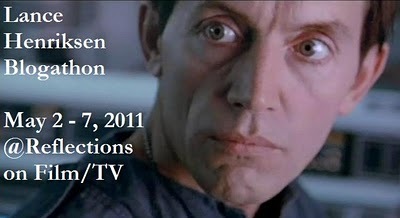 The dates for the Lance Henriksen Blogathon are May 2 - May 7, 2011, and the event is open to any and all bloggers with an interest in this amazing talent. The week of May 2nd has been selected for two important reasons. First, Mr. Henriksen's birthday is on May 5th, 2011, and secondly he is releasing his new biography on the same day, entitled Not Bad for a Human. The book is being published over at Bloody Pulp Books, an imprint of Steve Niles, and you can read more about the project here. Co-hosting the blogathon with me will be the book's co-author, Nightmares in Red, White and Blue writer/producer, Joseph Maddrey. You can check out Joe's blog devoted to Not Bad for a Human, here. I'm thrilled to have Joe aboard with me for a week dedicated to one of the greatest and most versatile character actors of his generation, and a man who has had a tremendous impact on science fiction and horror films, as well as cult-television. I have had the good fortune to speak with Lance Henriksen a few times; once for a telephone interview featured in The Unseen Forces: The Films of Sam Raimi, and once, more recently, when he was working on Not Bad for a Human with Joe. In both instances, I got a good feeling for Henriksen's personal and professional aesthetic or credo: total commitment, total honesty, and total freedom of artistic expression. So those are truly the only guidelines for the upcoming blogathon. Basically, any blogger who wants to write about Lance Henriksen during the blogathon week should do so on his or her blog (as often as you like), and then e-mail me their links at the address in my contact information (on my blogger profile page) so I can lpost a snippet or excerpt of your work and link back to your blog. I'll be checking my e-mail many times a day, every day, that week, and putting up links and snippets regularly, as well as my own original Henriksen content. As far as content is actually concerned, the sky is absolutely the limit. We're looking for film or TV reviews, lists, photo essays, poetry, videos, podcasts, birthday wishes...anything that floats your boat, Henriksen-related. There's certainly a universe of content to consider, since Henriksen has appeared in over 160 films, from westerns to action films to sci-fi and horror and also starred in three seasons of Millennium. So please join me and Joe here for the Lance Henriksen Blogathon, from May 2 - 7. I know there are great treats in store, with special pieces by friends across the blogosophere, and hopefully the event will really kick off Mr. Henriksen's birthday celebration in high style. Below (and also above), I have posted a few banners for the upcoming blogathon. Please feel free to copy them and post them on your blogs if you're planning to participate. We can't wait to see what everyone comes up with!" 1 Response to "Coming soon! Lance Henriksen Blogathon Week!"